At Quality Log Home Builders, we’ve been building log homes and log cabins for more than 35 years. We know where to get the best solid wood and engineered logs for your home at prices unmatched by the competition. Everything we do, and every log cabin and log home we build, is done with one thing in mind: quality. You’ll quickly see that this sets us apart from other log home and cabin builders. Better Products…Better Service…Better Log Homes. 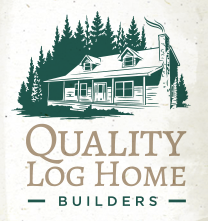 Before making any decisions about your new log home, contact Quality Log Home Builders. We’ll give you more information about our process, our materials, and our packages—don’t forget to check out our special offers! Our builders build exceptional log cabins in Eastern and Central North Carolina. Interested in having even more participation in your log cabin home? How about our log cabin kits / log home kits? Accessorize your cabin kit? Maybe you just want to be able to work with some of the finer inside details in your new home? The thing is that we’ve been doing log cabins/log homes now for decades. We’ve put families into their own turnkey custom homes all across NC and beyond. We’ve worked with potential homeowners to come up with the best possible plans and cabin designs that we can implement for them. We’ve provided design assistance to others while they handle their own building processes. We have provided raw materials including logs of the same high quality that we use in all of OUR log cabin homes for customers. The long and short of it is that, at Quality Log Home Builders in Kenly NC, we ARE the log cabin experts. We know what it takes to build a Quality log cabin home and we can and WILL help you each step of the way. Whatever your need. Whatever your style. Whatever your budget. If you want a trusted, experienced, knowledgeable builder on your side, you need Quality – call us today!